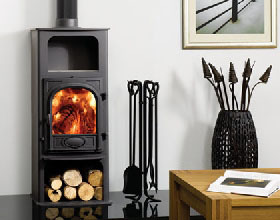 Dawlish Stoves, supplier and fitter of wood burning and multi fuel stoves, across Dawlish, Exeter, Newton Abbot, Dartmoor and the South Hams. We offer a complete package, from supplying the stove to installing the perfect flue for it, as well as servicing for your stove. Carbon neutral - wood from properly managed sources release no more carbon into the atmosphere than if the wood were left to rot. Within a stove the pollutants released are reduced due to the fact that the wood is burned much hotter than in an open fire. This reduces the release of particulate carbon. The UK produces large quantity of firewood, wood-pellets and other wood based fuels, meaning transport costs (both economic and environmental) are reduced. Price per kW - for wood is less even than gas. You may find issue with having to store your wood, particularly if you intend to use wood burning as your primary source of heat throughout the winter. With your wood burning stove comes the flue. We have experts in the field of flues and chimneys. Working both with new and existing chimneys we can install your stove perfectly and fully. The importance of a properly installed flue can not be understated. Poor ventilation for your stove will at best drastically reduce your stoves performance and efficiency, and at worst can result in potentially fatal carbon monoxide poisoning. We are HETAS registered and offer expert service and advice. We are specialists in flues and chimneys of all types, both installing and servicing. We can talk you through your options for new flues. We will make sure that your new stove and flue are safely installed and operating properly. Even if you have an existing chimney it is worth having a expert look at it, some chimneys have thin skins, too thin to contain the heat from a stoves exhaust gases. Properly fitted flues will encourage the exhaust gases from the stove to to flow smoothly out of the flue. The proper flow of exhaust gases draws fresh air (and more importantly oxygen) into the stove. This causes the fuel to burn at a hotter temperature.